Tuesday on the YarnThing Podcast with Marly Bird: Lianka Azulay, owner of Bonita Patterns! Bonita Patterns owner Lianka Azulay, born in Brazil, picked up her first crochet hook at age 7, and hasn’t put it down since. She is specializes in the research and use of unique stitch patterns in her designs to bring fashionable and contemporary style to crocheted pieces. Her first collection of patterns, Crocodile Stitch Fashions, was published by Annie’s Attic and quickly became the #1 best-seller in the publisher’s catalog. The huge success of her pattern collection touched off a trend, and the Crocodile Stitch became “one of the hottest crochet techniques in crochet today” (Crochet Magazine). Lianka believes that “having your own signature as a designer is important”. both Lianka’s book and 5 (FIVE) patterns from Bonita Patterns. I didn’t hear a key word… did I miss it??? I was mufti-tasking; but you guys were also having so much fun giving away prizes, it might have gotten lost in the shuffle. Well, since she’s famous for her crocodile stitch, I’ll use crocodile for my key word! I do love the patterns, and I’ve been looking at them and wondering what excuse I could come up with to make them. The crocodile stitch is so pretty and it must be super warm. it’s actually not the crocodile stitch that has been intimidating me, but the booties. My booties always turn out goofy, don’t know why. But now that i look at some of the bigger booties, and can see the stitches, these look like they are constructed a little differently… maybe they’ll work for my brain. I did not hear a key word as well, I listened to it a second time and believe it was left out. But what a fun blog cast that was. Just love that crocodile stitch. I am a crocheter and a knitter. My grandmother taught me to crochet and I bet she never thought there would be the wonderful crochet patterns available today. Thanks for some fun, laughs and expanding my creativity. Glad to know I’m not the only one that didn’t hear it! Gosh, I didn’t hear the key word. But I I listened with great interest because I just took Marleys class Curvey Crochet at Stitches East. It was great and Marley you are as cute as a button, even with a hat ;). I missed the key word also. I did love the podcast and I’m happy Lianka Azulay is doing so well, her patterns are really cute. They come at a good time for me as my niece is going to have a baby and I just know she would love the crocodile stitch booties. Thanks for a great show. You are always giving me new ideas and I’m learning more about knit and crochet and the people who creat so many wonderful designs. No key word was mentioned, so I’m going to choose one that I think is fitting: AMERICAN DREAM. I am so excited for you Lianka to be so successful and able to share your wonderful talent and passion with everyone! And you can make a living doing so. I will be an American Dreaming in the wonderful colors of your patterns. 🙂 Blessings! I think I like this game of choosing our own key words. American Dream is a perfect one! I listened twice and I didn’t hear a key word. I loved the podcast and Lianka and her American Dream. I have always wanted to do the crocodile stitch booties. I can’t wait to start them. I too feel better, since I went back twice listening for a key word. I was interested in the crocodile stitch and her many patterns showing off that stitch. I haven’t done the crocodile stitch, but i look forward to trying it. I’m looking forward to trying the Crocodile stitch. My most recent projects have been knitting. I need to show crochet a little love too. There was no keyword. 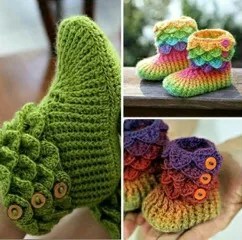 I’m more of a knitter but those booties are too cute not to try making them!! Thank you Lianka for your very generous heart. And there wasn’t a keyword, you guys were having too much fun giving away so many prizes!!! Thanks for another interesting podcast! I haven’t tried the crocodile stitch yet, but the Bonita patterns are so beautiful I’ll have to check it out! Lianka’s style and yarn choices are delightful! I didn’t hear a key word but it should be Crocodile Stitch! That is a fantastic stitch. Love your accent Lianka!!!!! I didn’t hear the word either and listened this morning viaPodcast. I’m going to go with crocodile stitch…the stitch that started it all!! Awesome podcast as always! Lianka’s story is so inspiring! I love that she is popularizing lesser known crochet stitches like the crocodile stitch. Her braiding techniques are intriguing as well – fantastic work! Love your patterns. I too am Portuguese. Something about crochet and Portuguese girls…lol! I have been eyeing that lovely red sweater pattern… So pretty! Thanks so much for this great giveaway. I remember seeing an absolutely stunning wedding dress made in Crocodile Stitch and designed by Lianka at a fashion show at the Knit and Crochet Show in Greensboro, NC. Her sister was modeling it and it left most of the audience, myself included, speechless!!! The crocodile stitch boots are so adorable. Granted, all of Lianka’s patterns are beautiful and extremely creative! I need to give my crochet a little more love and it looks like those boots are just so adorable. Maybe I should make them for friends of mine that are having a baby in the summer. I think they’d love them!